Last day of 2013! It was a big year for my family, on different levels. My children started 1st grade and Kindergarten, which are two big milestones. We bought our house, which we had been living as renters for over 3 years (thank goodness we don’t have to move!). My grandmother moved from my hometown to live with my aunt in Dallas, but she is doing well. We became pet owners again (from zero to 5 cats is extreme – anyone need to adopt a cat??). We all got another year older, but no health concerns. Our Christmas rotation is now complete, with a visit this past weekend to Dallas to continue our family tradition with my grandmother and extended family. Every first cousin, Aunt and Uncle were present. We were only missing two second cousins, and the step cousins. Actually, it was a pretty successful turnout for shifting the location after 42 years from four hours away. I also tried to put together a last minute gift, but didn’t make it. 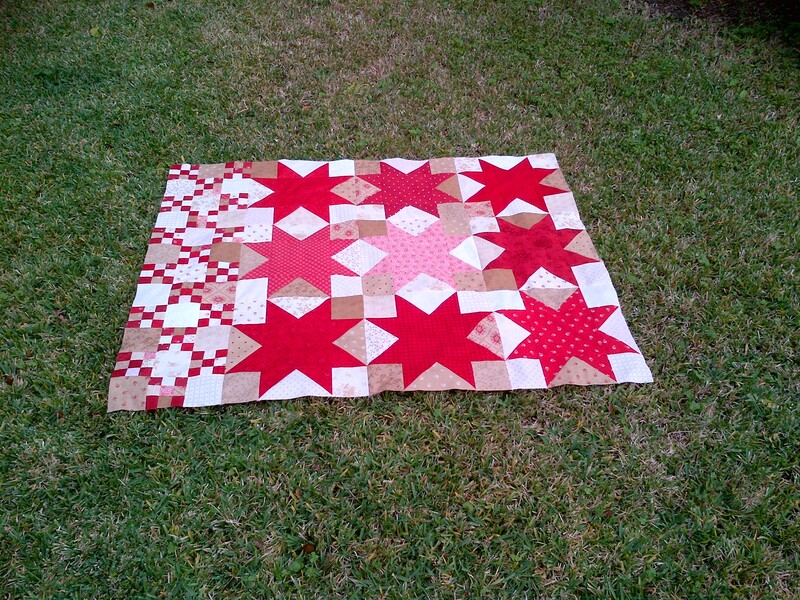 I did finish the table topper and pieced backing, but I ran out of time for the quilting part. This is a pattern called “Winter Seeds” and it was on my bucket list all year. 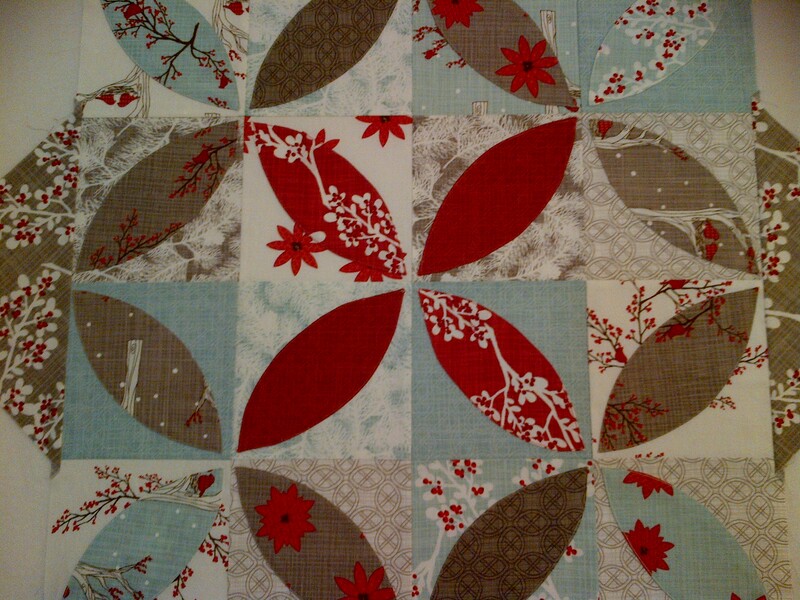 I used the fabric collection “Winter’s Lane” by Kate & Birdie Co for Moda. Beautiful ice blues, grays and saturated reds. 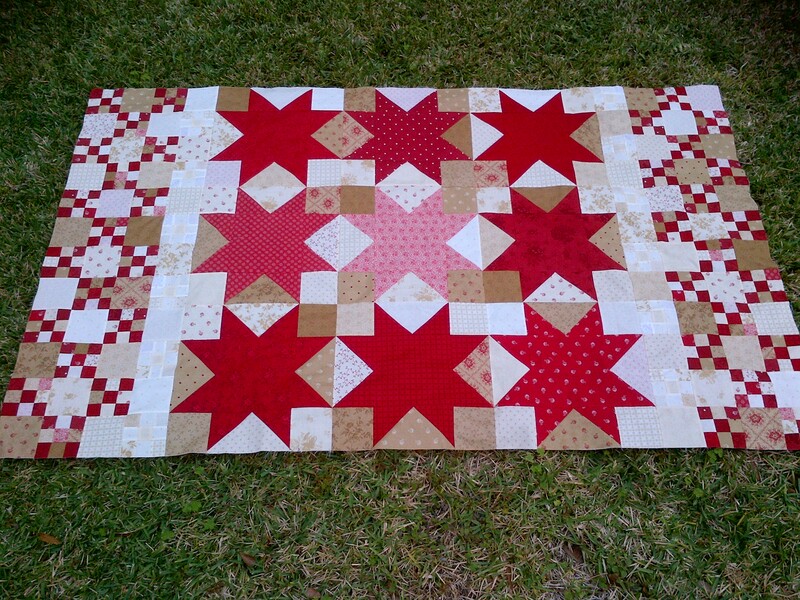 The pattern was from The Crafty Quilter and her blog … click here to go to her post. Here are some more pictures. I machine appliqued the ‘orange peel’ shapes with a tight top stitching and matching thread. 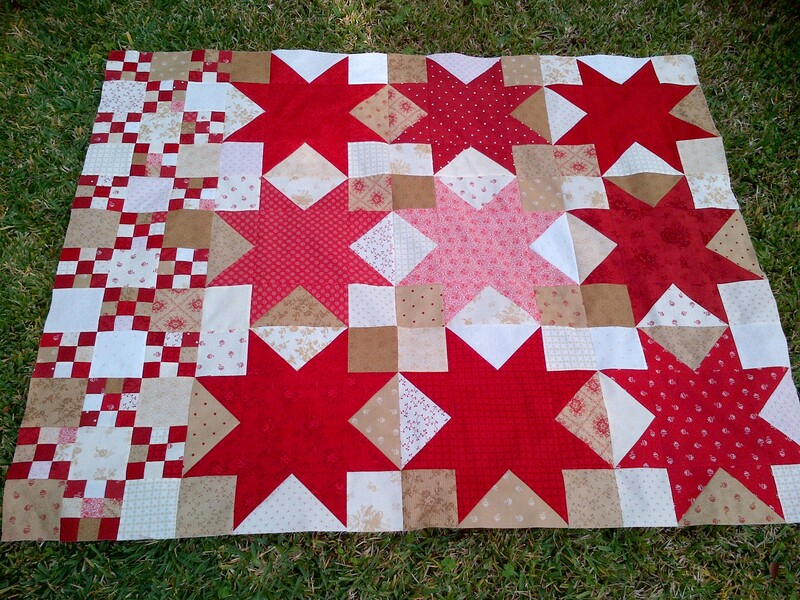 There will be some waste of the backing, but if you look at the Crafty Quilter’s blog pictures, you will see how it all comes out. It’s perfect! Now that Nantucket was completed, I am moving on to my other BOM projects. 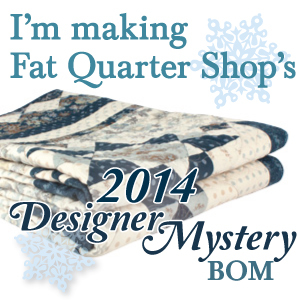 I am three months behind on the FQS DM BOM 2013 quilt. 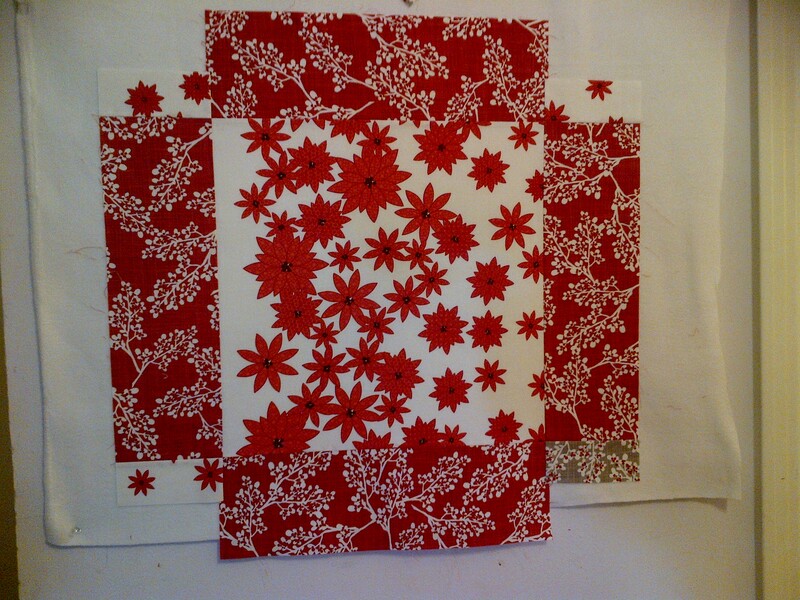 I started on Block 4 yesterday and have gotten the pieces cut out. 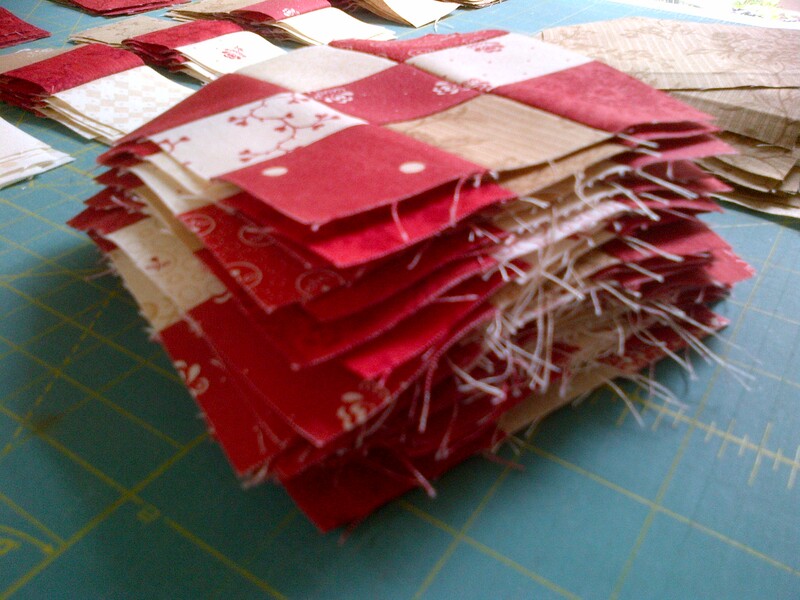 Like the other months, I am cutting out two blocks from the one set of fabric. I was able to get everything I needed, but I had to add the smallest amount of background fabric, which I had from an earlier month. 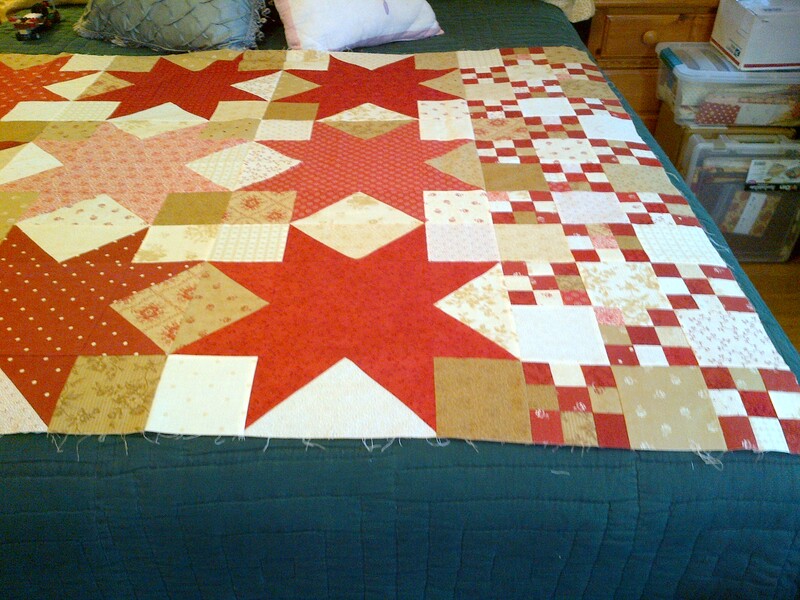 This morning I finished the center star portions with the surrounding strips. 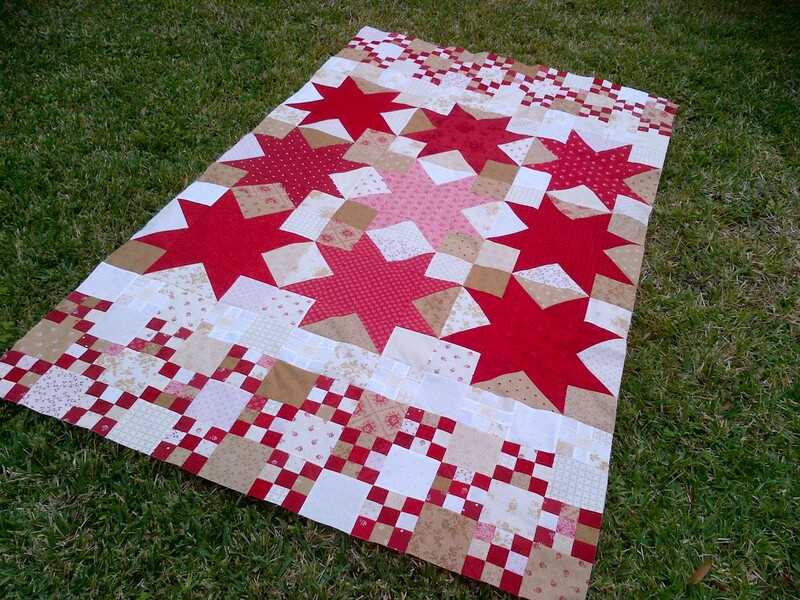 Next is the red/striped flying geese units. 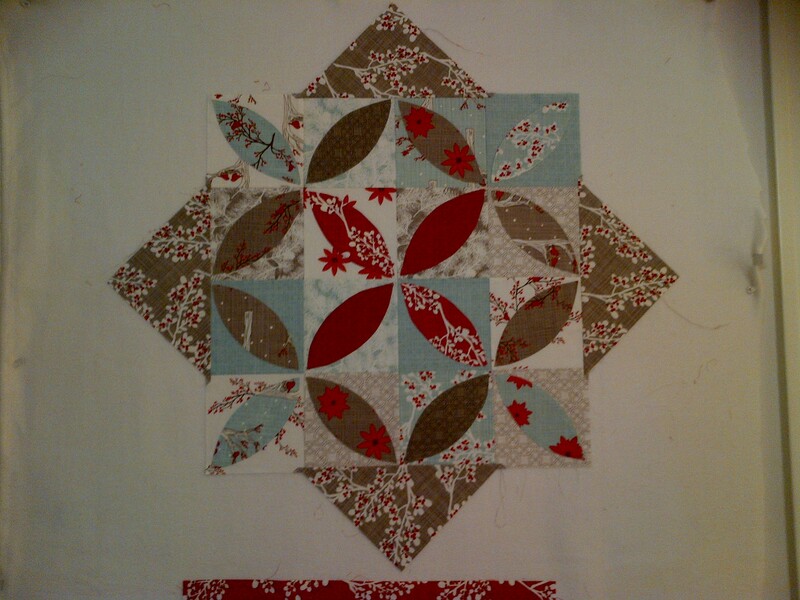 I want to get this block done tonight! I’m so thankful for my family and friends and I look forward to all our new adventures in 2014. I hope you have a great evening tonight and I look forward to visiting with you again next year! It was a magical experience and Oliver celebrated his 7th birthday while we were there. I’ll pull out some good pictures to show you on the next post. This is a quick update to get me back on a roll. 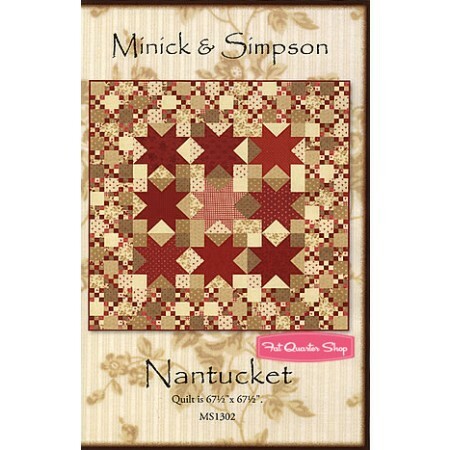 I appreciate the comments that you guys sent in about my neutral border addition for Nantucket. I completed the other side today and was able to get some pictures taken just before the sun went down tonight. It will be a race to get it done for Christmas. My Dad turns 71 on Christmas Day and I really want to have the top done for it. But, returning a bit to our trip to Walt Disney World (WDW) … I am not a fan of flying. I spent years traveling as a software consultant and flew about 3 out of 4 weeks each month for work all over the country. Sometimes in big planes. Connecting flights. Most of the time it started with ‘puddle jumpers’ between a small regional airport to DFW airport. I was even a Platinum member with American Airlines a couple of years. First class upgrades at no cost – that kind of stuff. But after the birth of my first child – I no longer wanted to step on an airplane. I have, in fact, not flown in just over 7 years now. I have driven from the Carolinas to Texas multiple times and back, and now we have driven from Texas to WDW Florida and back this past week. 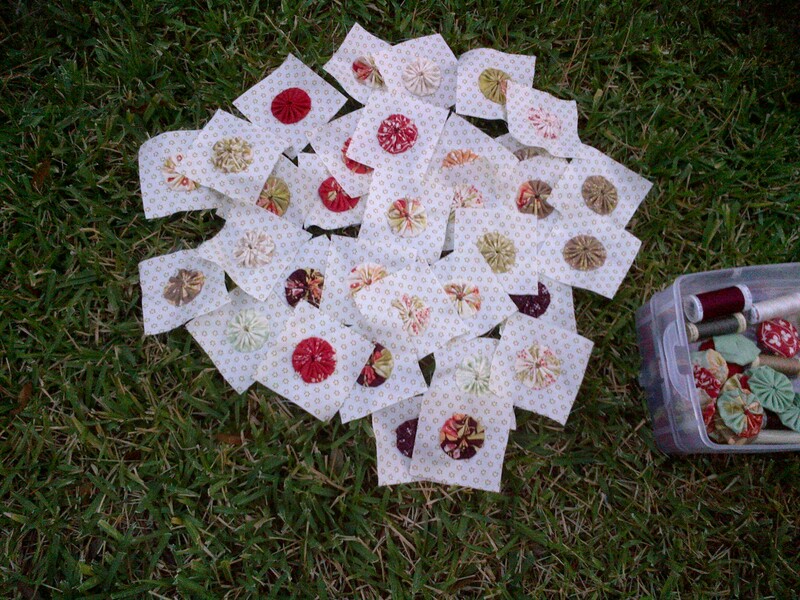 All of that is to ramp up to the photos of my travel sewing project … Yoyoville by Bunny Hill Designs! I thought I had plenty of squares cut up and inside my little box – but I found out by the time we arrived in Florida – that I could have completed all of my blocks if I had been more optimistic of my goals. As it turned out, what I thought was a LOT of squares, was only 35. Got those done with no problem at all. 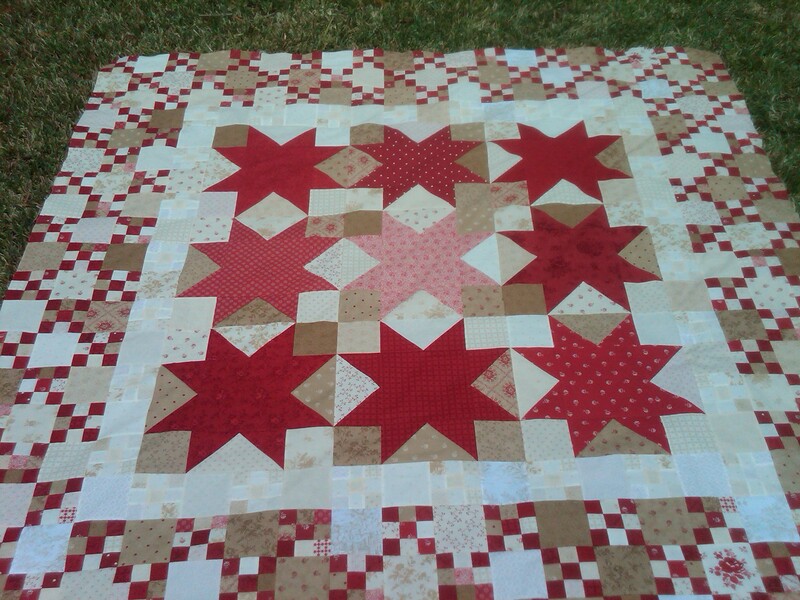 I need to count all of my blocks now to see how many I have left to do for the main portion of the quilt. Don’t they look great though? Tapestry fabric collection for the yo yo circles and a fabric from the most recent Honeysweet for the background (both by Fig Tree Quilts). It was already dusk outside when I took my pictures. So they look a little darker than they are. I am also happy to announce that we are finally homeowners once again! We closed on our house two days before we left for our trip. We have been renting our home for over 3 years and we now own it. We love the location and are looking forward to getting some professional renovation designs drawn up. 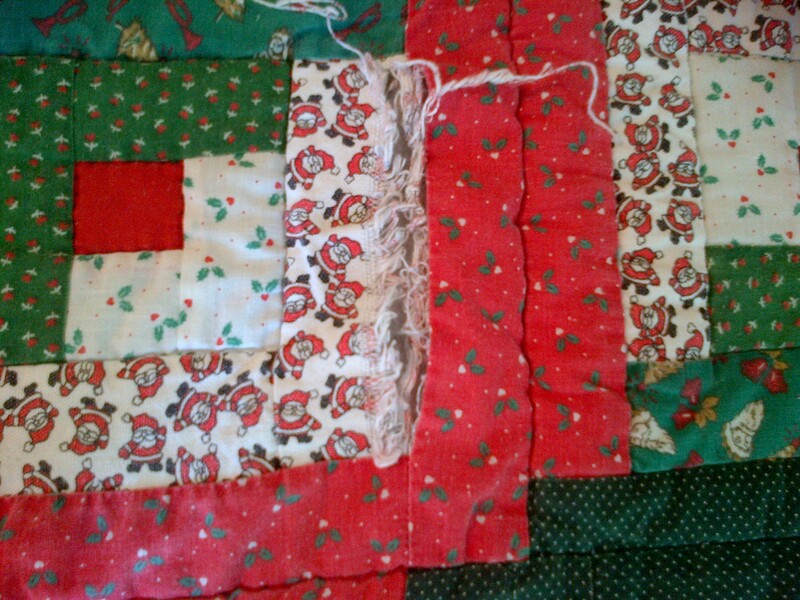 The house is over 70 years old and has a few items to fix – but we love that it is our family home and – like a great quilt – we will make it our own! Hope everyone had a great Thanksgiving. I’m enjoying catching up on my blog reading. You guys have been busy! I’m slow going for sure, and the holiday week won’t provide any additional progress on Nantucket. 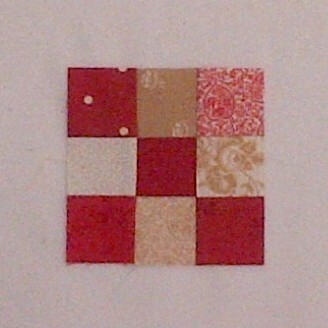 I did, however, get my additional blocks pieced into one side of the quilt. 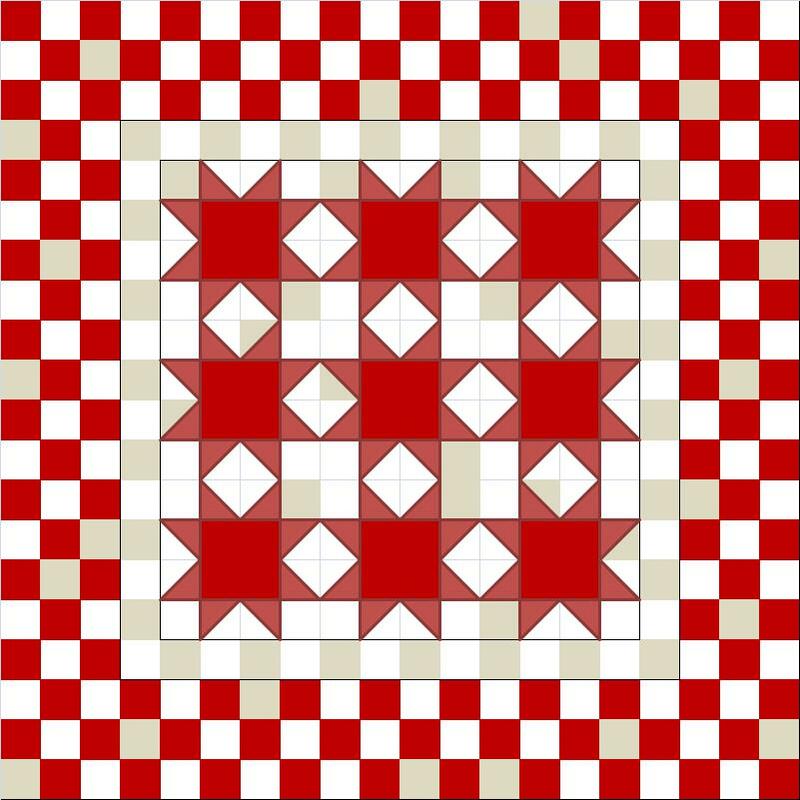 I wanted to try a completely neutral 9 patch unit and audition a row of them between the stars and the checkerboard border. 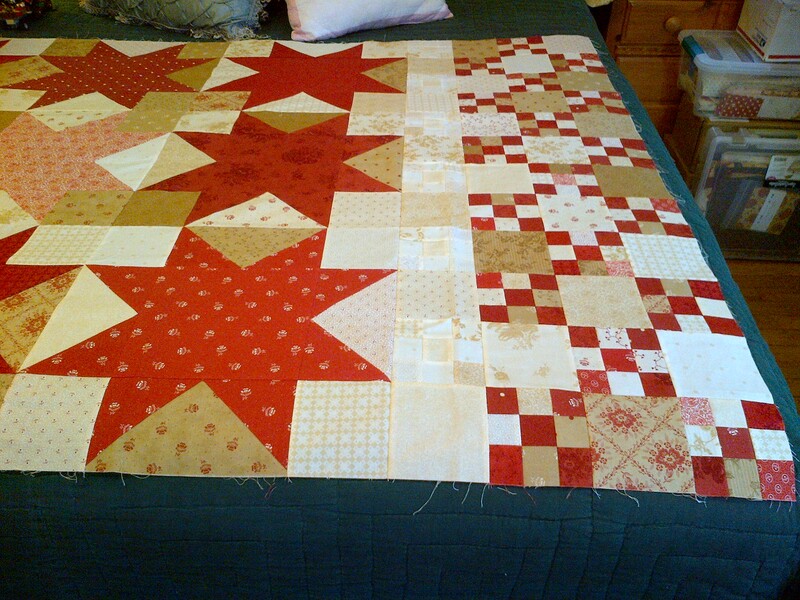 Something to set them apart and give my eye a place to rest, and honestly, to also expand the size of the finished quilt just a bit too. 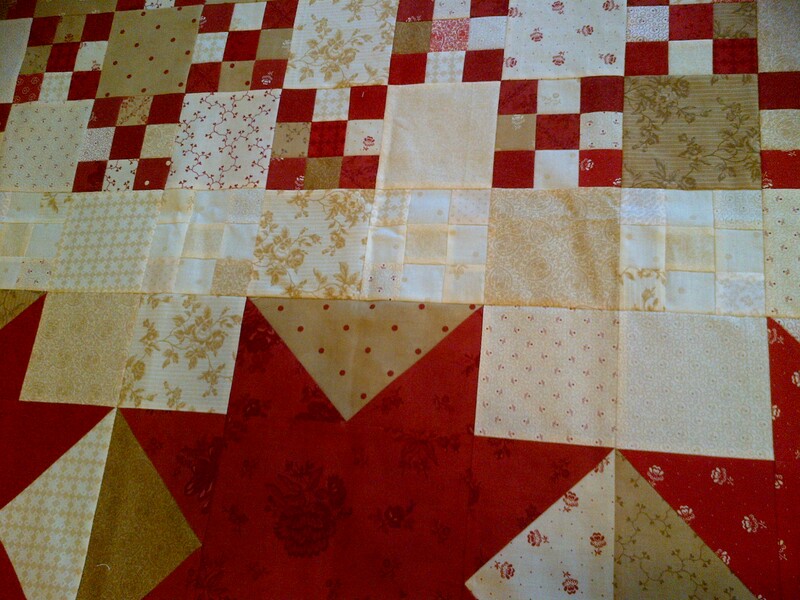 I like both, but I am going to proceed with the extra neutral blocks. I like that it makes it my own unique result and I think it will be great when I finally have the rest of it put together. 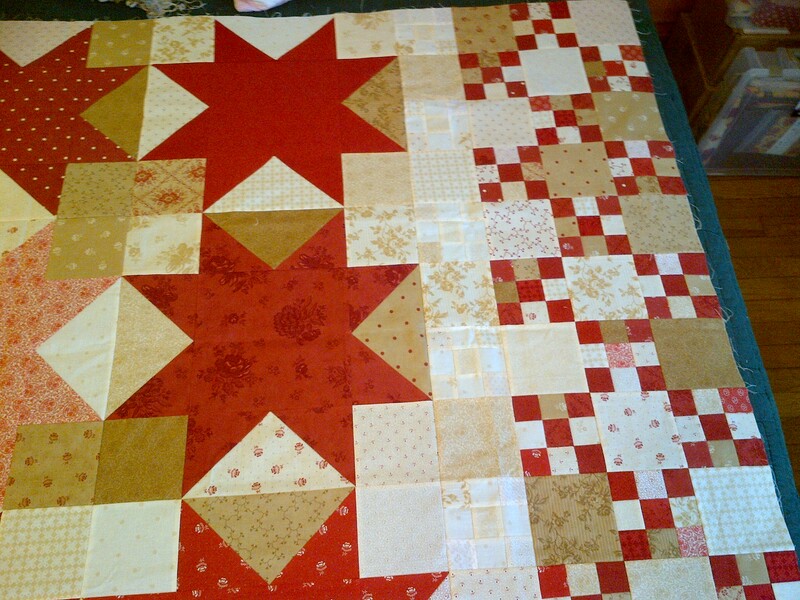 Looking at it now, I wished I had previewed a block with a red center square in those neutral 9 patch units. Too busy, or just enough to pull the borders together as a group. May have to look into that thought some more. 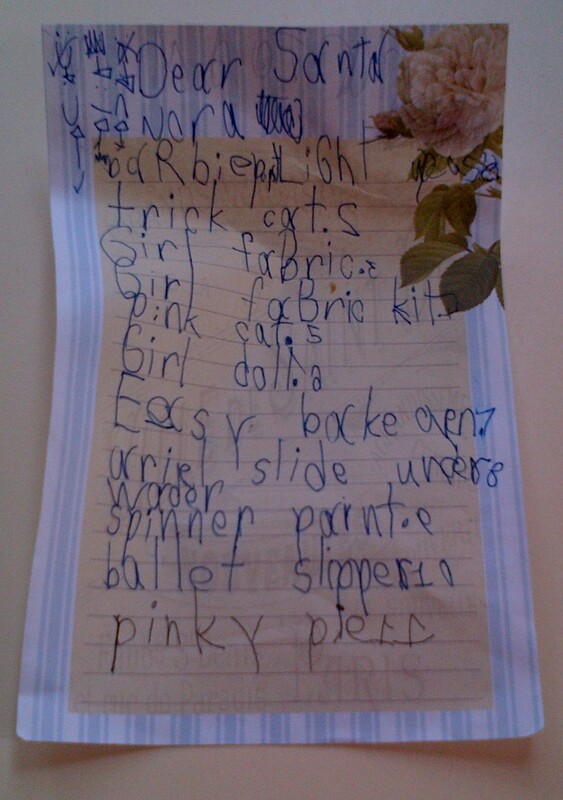 I thought I would share my daughter’s Santa list for this year. This is the year for the Easy Bake Oven. I’ve sacrificed this great gift idea to my mother, so she can give it to her. I’ll have to come up with something special now from her mommy and daddy. Probably something princess or ballet related. And I plan to make each of them their own special pillow case. I think I’ll keep that up as a tradition. Can’t quite jump into Christmas spirit just yet though … one more week of Thanksgiving and my son’s birthday next week, then we pull out the boxes and tree! I’ll be able to show you a preview in real cloth by tomorrow night. Stay tuned! I got a bit further this weekend on Nantucket. 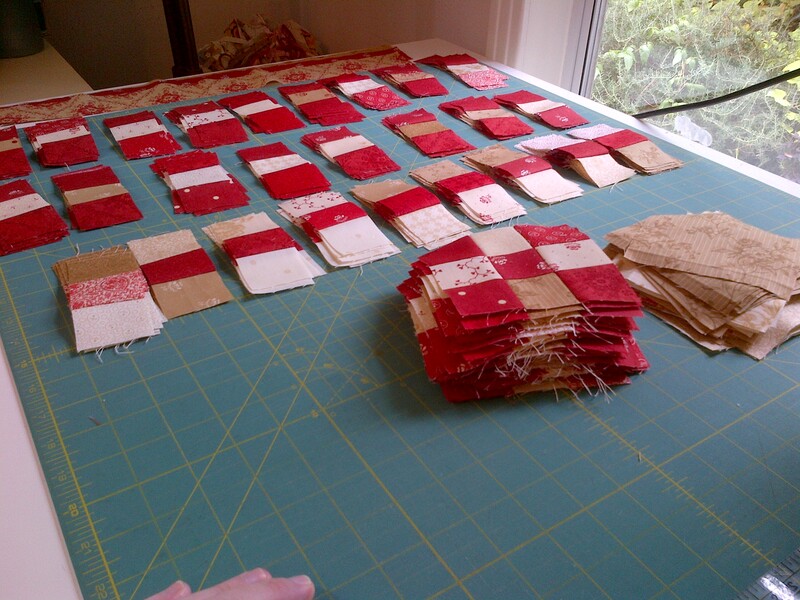 I forced myself to complete the sewing of all the strip sets for the 9 patch units and to cut them all up before I began joining the border together. I wanted to make sure I was going to have the right randomness and didn’t end up with a concentration of a particular group of fabrics in one side of the border, for example. 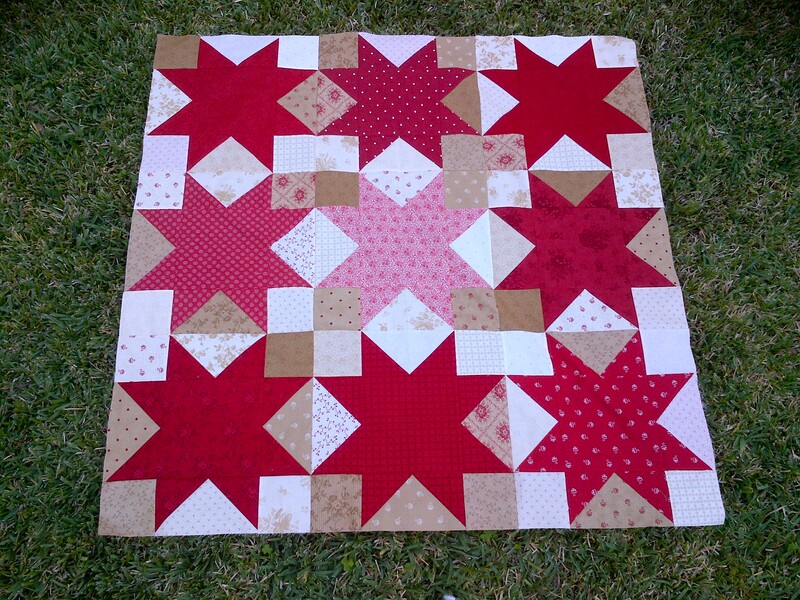 I do have my thoughts about inserting a single fabric inner border between the 9 patch border and the center star group… just to give the eye a place to rest… but I’m trusting the pattern and will reserve judgment until the end. So – how do you like it so far? 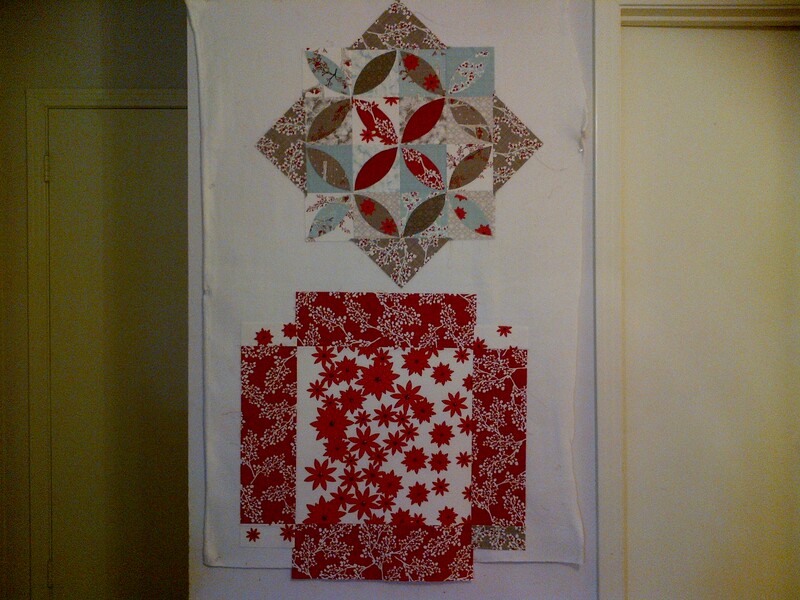 I have the right border section on the design wall, just waiting to get pieced and attached. 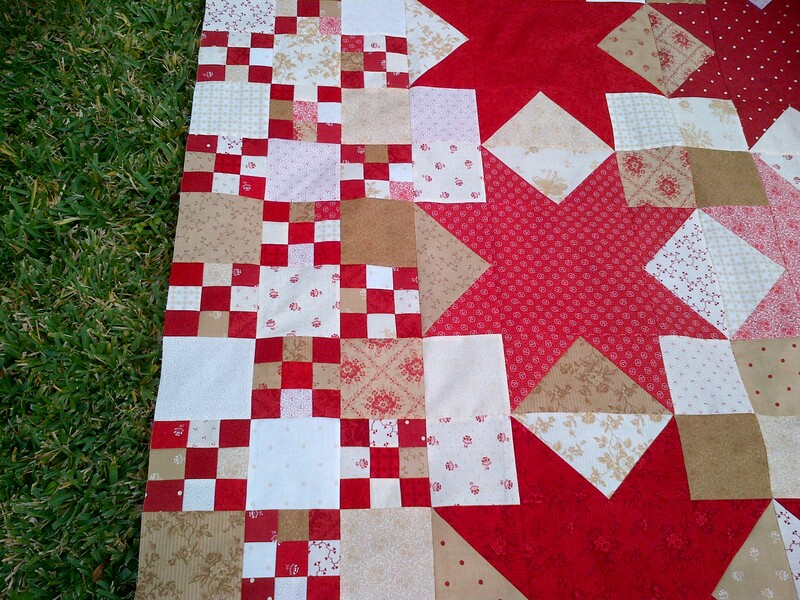 I hope I can get this done in time to quilt it myself before Christmas. Thinking my Dad deserves a quilted gift this year. He’s done a lot for me and my family (always in joint with my mom, but you know…). Keeping up with the Big Girls! Weekend is drawing to a close already. Too fast for sure this time, as it probably will be for the rest of the year. It will be 2014 before we all know it! 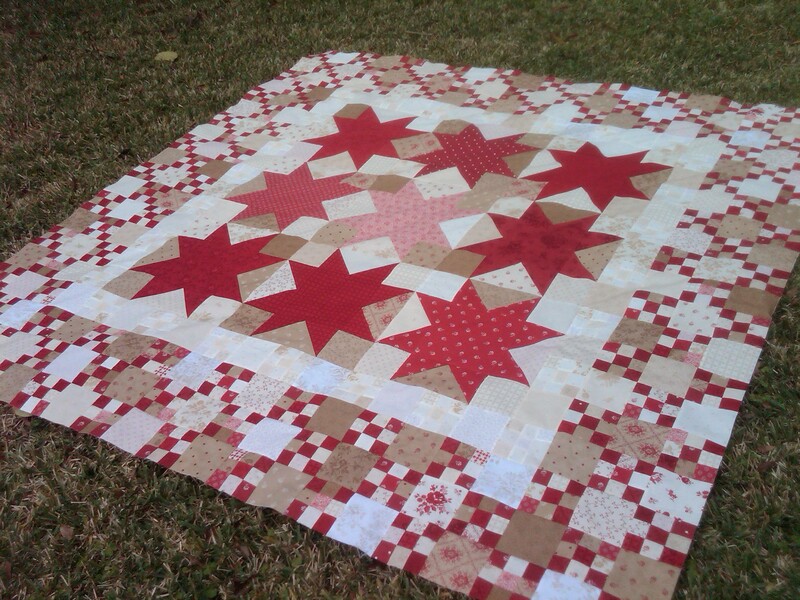 I got the center stars completed for Nantucket. 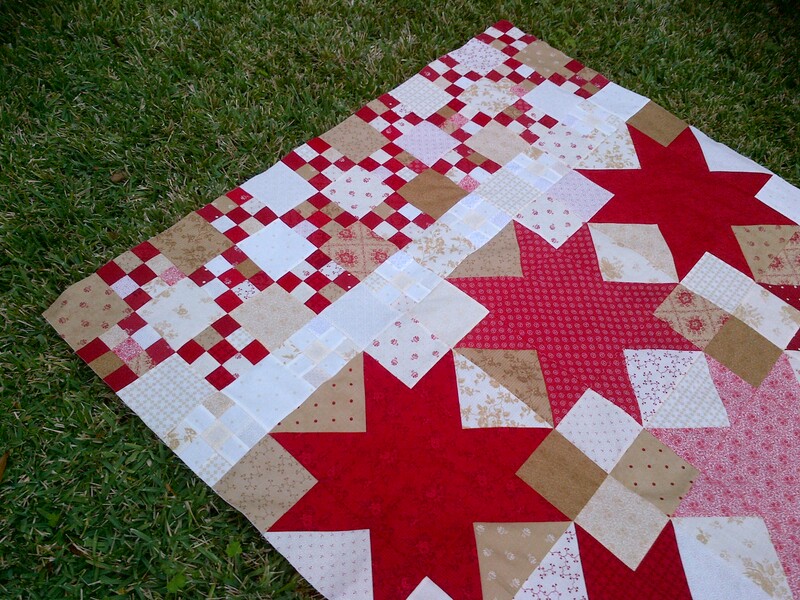 They actually go really fast and you end up with a flimsy of about 45″ square, before the 9 patch borders. This looks so cozy already, I just want to get it on the couch! 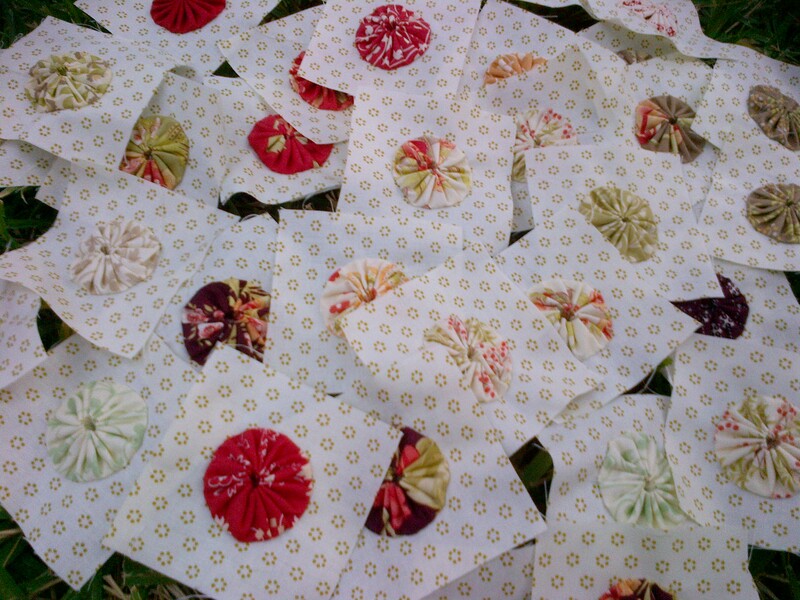 You can sew along with a group of bloggers who are all doing the Nantucket pattern. Nicole, Lisa, Thelma and Sinta are the ‘official’ group – but many are joined up as well. 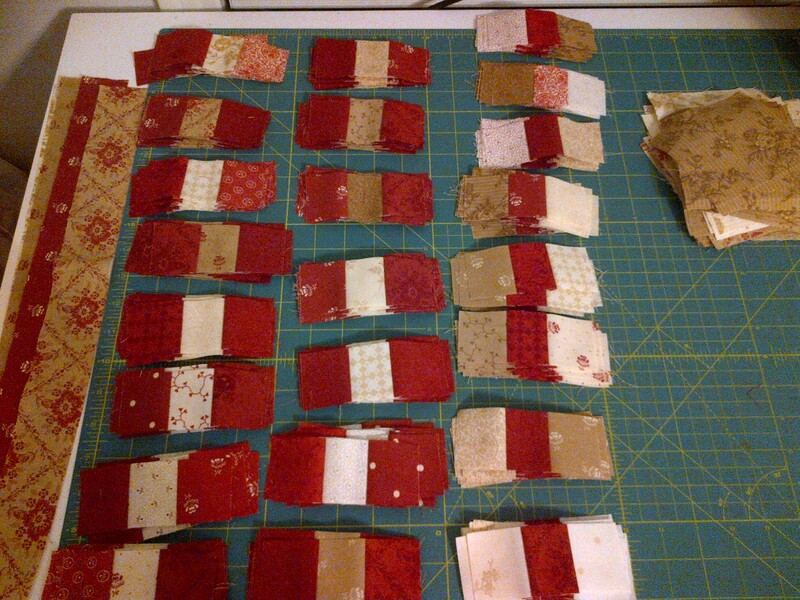 I started on my strip sets for the 9 patch unit. Had to make at least an inspirational one to get me going… The first of HOW MANY??? Ok, it will go fast too I’m sure. 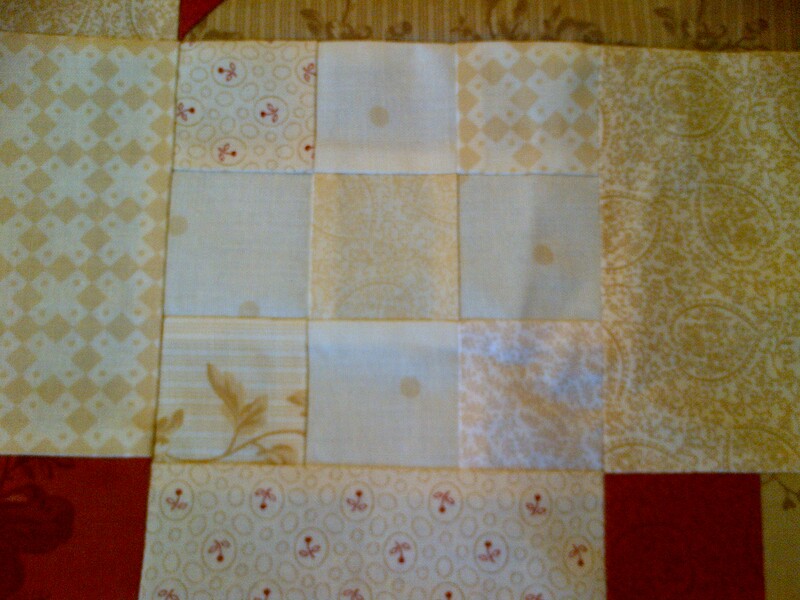 Good practice for getting a perfect quarter inch seam allowance. 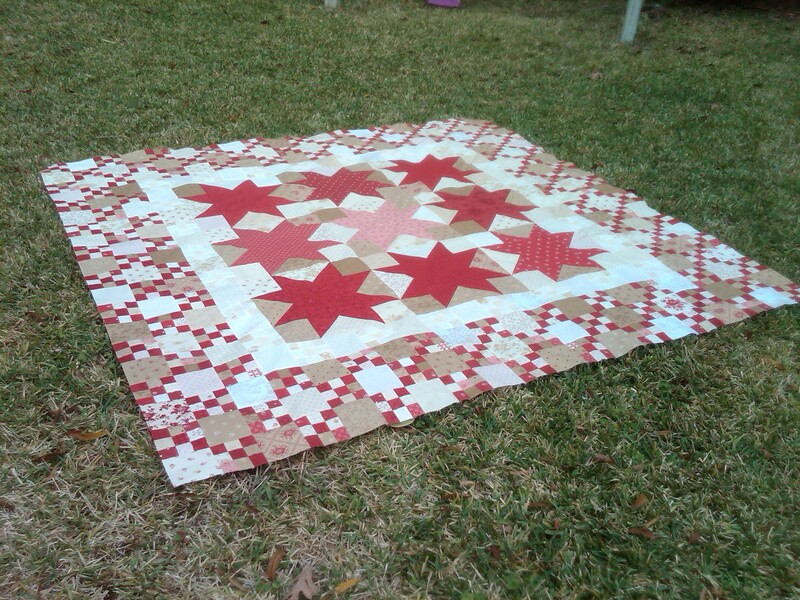 Thought I would also share a couple of pictures of my first completed quilt. I made it in 1990 or 1991 I think. During college, pieced a little over half of it by hand, and then the rest on a new Singer machine, cut the pieces by hand with a pencil and yardstick as my guides. 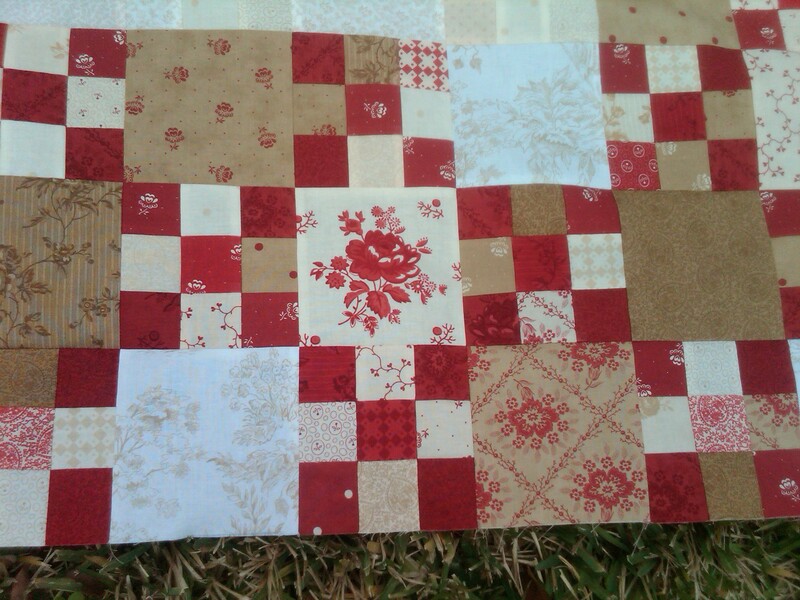 No pattern really, just laid out the log cabin blocks in a ‘barn raising’ layout (?). 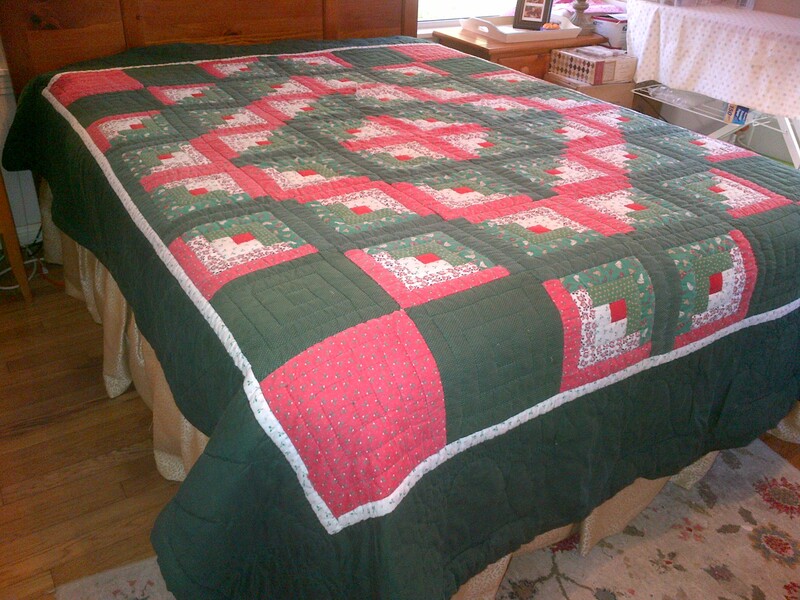 My grandmother helped me handquilt it after I borrowed her four long wood slats and clamps that she herself used in the day to do quilts. I hung the frame from my bedroom ceiling with hooks. It will be a memory that I will be able to treasure forever! 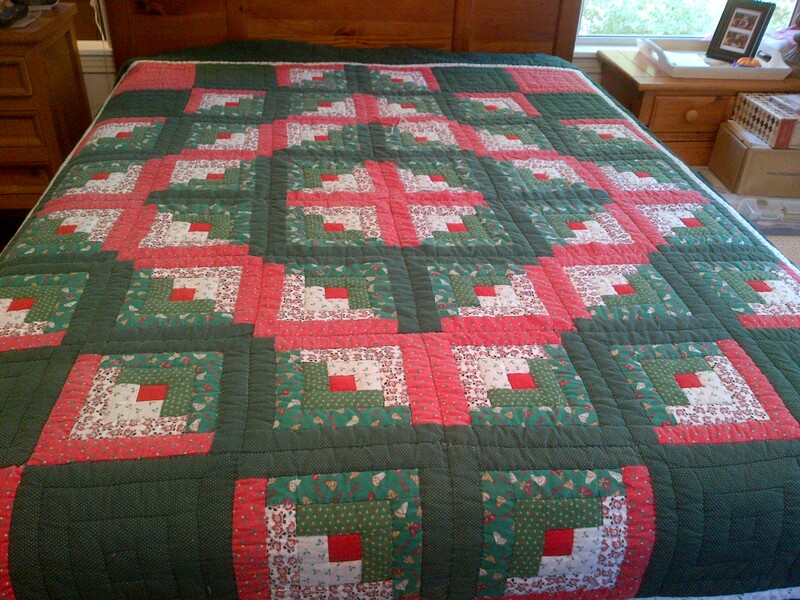 The backing was a king size green sheet and I rolled it to the front to make the binding. 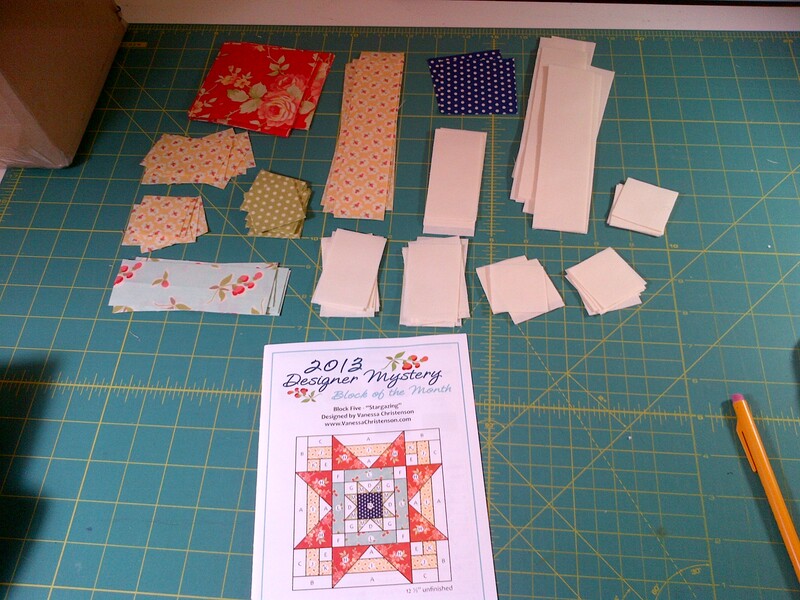 I may have bought a second sheet to cut up for the borders. I used extra loft batting and this thing is thick. 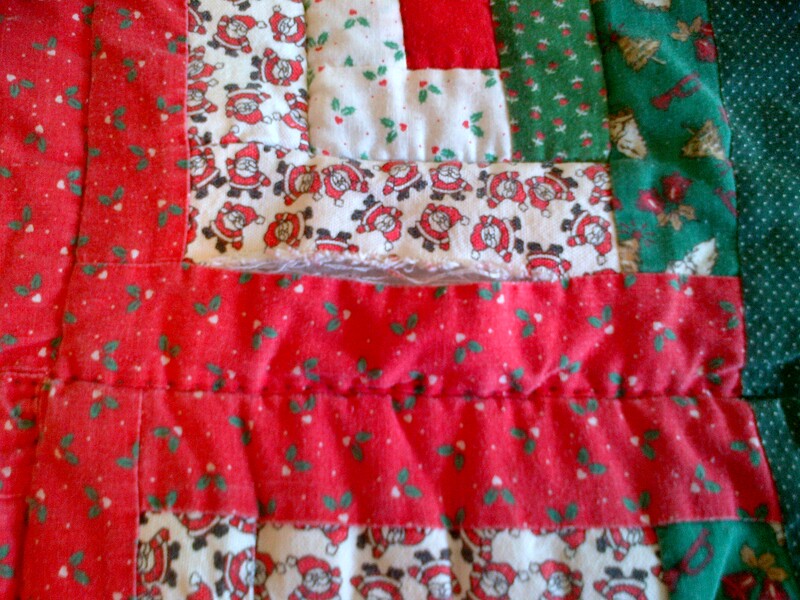 I just outline quilted the cabin blocks, but did my best to put some holiday themed items in the borders (bells, holly berries, feathers). Unfortunately, through loving use and poor quality materials – a couple of spots have come up that are in need of great repair. 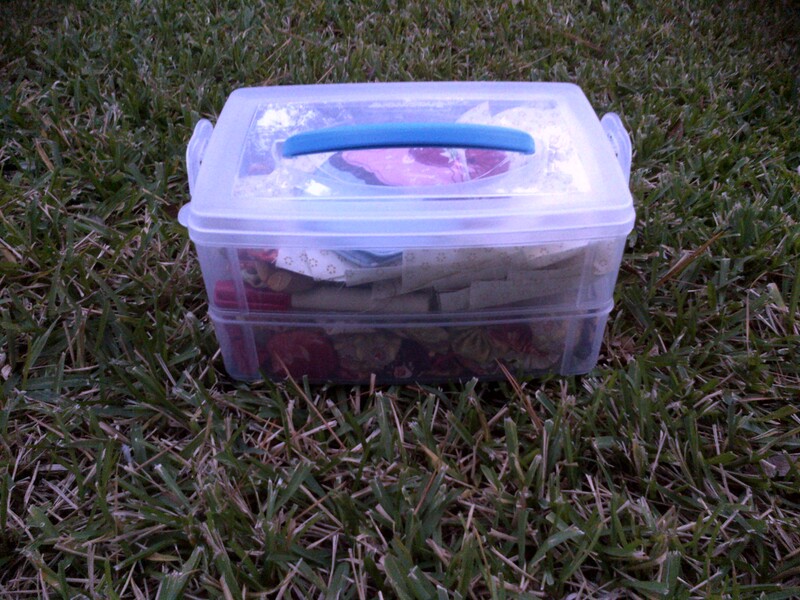 I still have the scraps in a bag somewhere, tucked away in my closets. I’ll need to get these mended somehow. 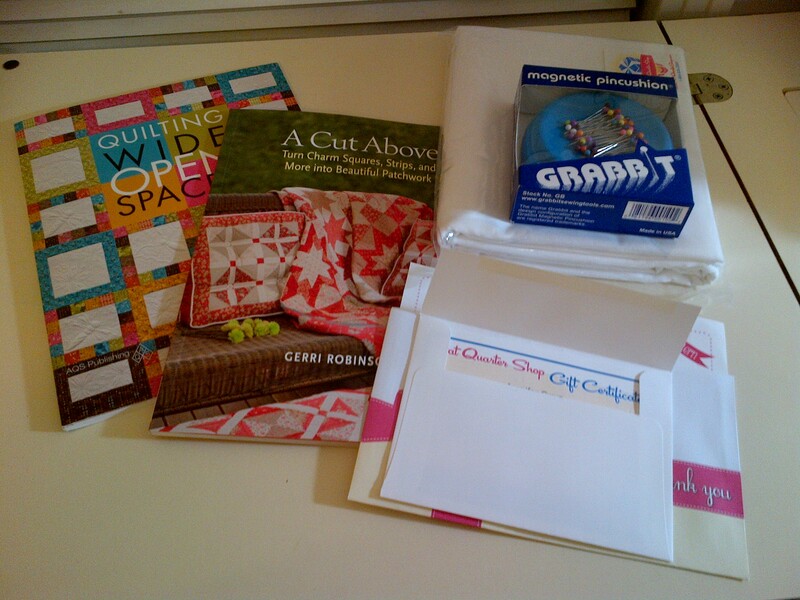 I’ll be on the search in blog land for some good tutorials on DIY quilt repairs. Thanks again for stopping by! I hope you had a great weekend also!